www.DutchOpenDays.com has been developed by A Star Future Ltd, the organisation responsible for providing schools and colleges in the United Kingdom with information about international higher education. Since 2006 we have been monitoring the interest and intentions of British students with regard to universities abroad and we have noticed many changes, particularly in the last year. During our presentations in schools it has become clear to us that many students will be motivated to go abroad as a direct result of the changes in English university tuition fees. This has led to a huge increase in questions about studying in Holland and requests to visit Dutch universities. As a result, we decided to develop a specific website to let you know when Dutch universities are holding their open days and how you can find out about them. In conjunction with our www.studyinholland.co.uk site, you can now identify which universities might be suitable for you and arrange to visit them to find out more. 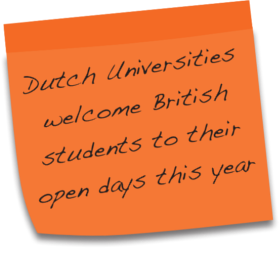 Many British students who are now at Dutch universities tell us that going on an open day made a big difference when deciding to study in Holland. While we make every effort to ensure that the information on www.dutchopendays.com is correct and up to date, it is difficult to ensure that it always reflects the reality of studying in the Netherlands. If you have any questions that are not answered by the site please feel free to contact us.